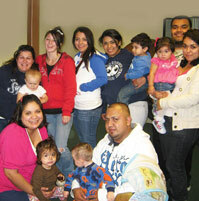 If you’re a teen parent in the DuPage County community, you’ve come to the right place! Teen Parent Connection’s Group Services Program allows you to find commonality, strength and encouragement to help you meet the demands of parenthood. Plus, these services are yours completely free of charge! Our groups are specifically designed to answer your questions and concerns. Discussions are based on your needs, whether personal, social, legal, or practical. How can I best care for my child? What do I need to know to raise a healthy baby? What kind of immunizations will my baby need? How do I get help with child support? How can I find affordable childcare? What rights do I have as a father? Our Group Services Program uses a variety of curricula and materials, including Child Development and Basic Care, Nutrition, Job Readiness, School Completion, Healthy Relationships and much more to encourage a complete support group experience. Our Parent Group Facilitators are well educated and extensively trained to be your reputable source for resources and information. Open to pregnant adolescents, ages 12-22. Open to pregnant or parenting adolescents, ages 12-22. At weekly evening meetings, you will enjoy a free meal and meet others who share many of your experiences. We also include a wonderful time for your baby! Childcare Specialists run a safe, supervised nursery during Group time. For more information on how to get involved, please email info@teenparentconnection.org or call (630) 790‑8433 Ext. 239. Are you a pregnant or parenting teen? We can help. Understand the issues, learn about the realities. You can help empower young families & prevent teen pregnancy. Use your gifts of time & talent to get involved.